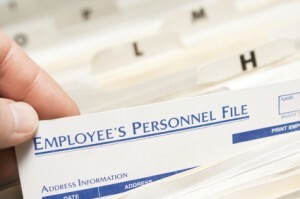 All current and former employees have the right to inspect and copy their employment file. Every employment attorney knows this fact. But what exactly are your rights? What are you entitled too? Can your company refuse? Every current and former employee, or his or her representative, has the right to inspect and receive a copy of the personnel records that the employer maintains relating to the employee’s performance or to any grievance concerning the employee. Generally, an employer must comply with your request within 30 days. If they fail to do so you should contact an experienced employment lawyer. What must the employer give the employee? According to Labor Code section 432 and the Department of Fair Employment & Housing (DFEH) employers are required to give an employee or job applicant, upon request, a copy of any instrument that the employee or applicant has signed relating to the obtaining or holding of employment. What happens if my employer refused to disclose my file? If an employer fails to permit a current or former employee, or his or her representative, to inspect or copy personnel records within the times specified in this section…the current or former employee…may recover a penalty of seven hundred fifty dollars ($750) from the employer. Employment Attorney – What about my payroll records? According to Labor Code section 226(b), employers are required to permit current and former employees to inspect or copy payroll records pertaining to that current or former employee. An employer who receives a written or oral request from a current or former employee for his or her payroll records shall comply with the request within 21 calendar days.